Your 12-18 month old’s ever developing dexterity lends itself to more enthusiastic and confident self feeding attempts during this stage. With these seasonal menus of happy, healthy handhelds you’ll have some fun foods at the ready for your little one’s snacks and meals. From purees to finger foods and beyond, your toddler has come a long way on their venture into solids. Here are some tasty ideas to help keep them intrigued in discovering new foods in the coming years. Your 9-12 month old is developing many new skills and abilities, so there may be some changes in store for their feeding time as well. 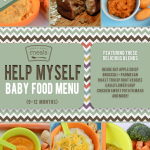 With a new set of seasonal menus, you can begin to venture into this next stage of your growing baby’s exposure to solids. Whether this is the next step in your little one’s culinary adventures or their first exposure to the great big world of food. 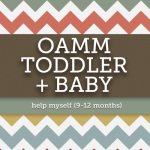 Does your little one seem ready to venture into the world of solids? 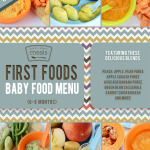 For our early starters in the 4 – 6 month range we’ll take a look at a few reasons you may want to introduce some basic foods now and a menu of some super simple purees to try. 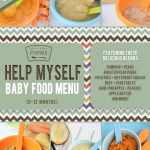 Before diving into the first Baby & Toddler food menu, let’s check out some of the equipment, both tried and true and shiny and new, that can help make baby food preparations a little easier. From wandering the produce department to freezing individual portions, the latest installment of our Baby & Toddler Food series walks through what it looks like to start make your own baby and toddler foods at home the OAMM way. As we kick off our revamped OAMM Baby & Toddler Food series we’ll compare some of the pros and cons of homemade baby food versus it’s prepackaged counter part as well as get a glimpse of the tasty adventures to come. Complete menu of purees to make your 9-12 month old from seasonal Winter fruits and vegetables. 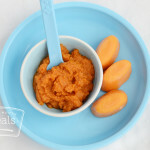 This mellow mix of white potatoes, butternut squash, apple and a hint of cinnamon is the perfect meal for 9-12 month old. As temperatures drop, and leaves begin to fall – warm your 6-9 month old with the delicious tastes of the season. 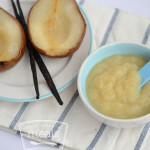 The delicious smell of pears roasting in the oven will certainly make your taste buds water and will be a delicious fruit option for your 6-9 month old baby! 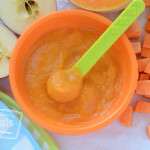 Your 6-9 month old can join in on the joy of all things pumpkin this season with homemade Baby Food Pumpkin Puree. 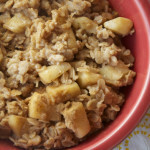 Chunks of tender apples, surrounded by whole grain oats, enveloped by the spices of the season, this Apple Spice Oatmeal is the perfect start for your fall mornings!